Security leaders that have sound policies and thoroughly monitor and report security effectiveness are well on their way to protecting their company from today’s growing swarm of increasingly potent threats. But here’s the bad news – more and more auditors, regulators, partners, and customers are demanding defensible proof of that fact. 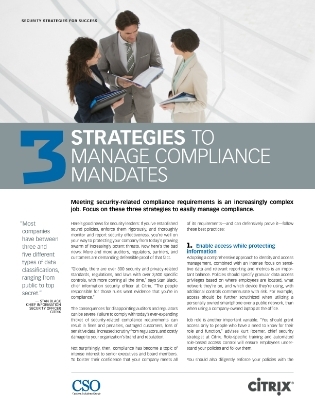 This white paper focuses on 3 strategies to easily manage compliance. Follow along with these guidelines to prove to senior execs and board members that your company meets all of its requirements and can defensibly prove it.